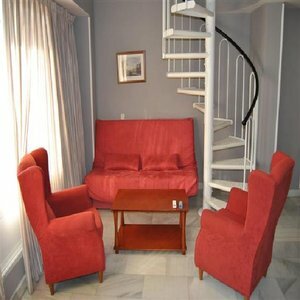 Apartamentos Principe 11 is located at 300 metres from the famous Puerta del Sol, in the heart of Madrid historical centre, in Barrio de las Letras district and very close to Plaza Mayor, Palacio Real, Teatro de la Ãpera, Retiro park, El Prado museum, Reina SofÃ­a and Thyssen Bornemisza museums. Within one of the busiest and most interesting commercial and gastronomic areas in Madrid. The hotel has an agreement with a car park nearby, therefore, guests parking there will have a discount. In addition, the hotel offers Internet connection, room cleaning service, booking of transfer to the airport and booking of excursions. NOTICE: The hotel has rooms of bis 4 adults + 2 children, always on request! The studies includes 2 single beds. The apartments with 1 and 2 rooms are all interior.